Yummmmm. This came out fabulous and I will definitely be making it again (my family has already made me promise to do so soon). All I did was make my crispy cutlets and then after flattening each piece, I put one slice of “ham” and 1-2 T daiya shredded mozzarella cheese on one end and then rolled it up and placed it seam-side down in the skillet. After browning both sides, I placed the cutlets in a glass dish and baked them for 20 minutes at 350 degrees. Finally, I topped them with the following sauce. I would say it felt like we were at a fancy french restaurant, perhaps in St. Remy in wonderful Provence, but apparently cordon bleu is an American recipe. Well, it felt like an amazing experience anyway – a journey for the taste buds! 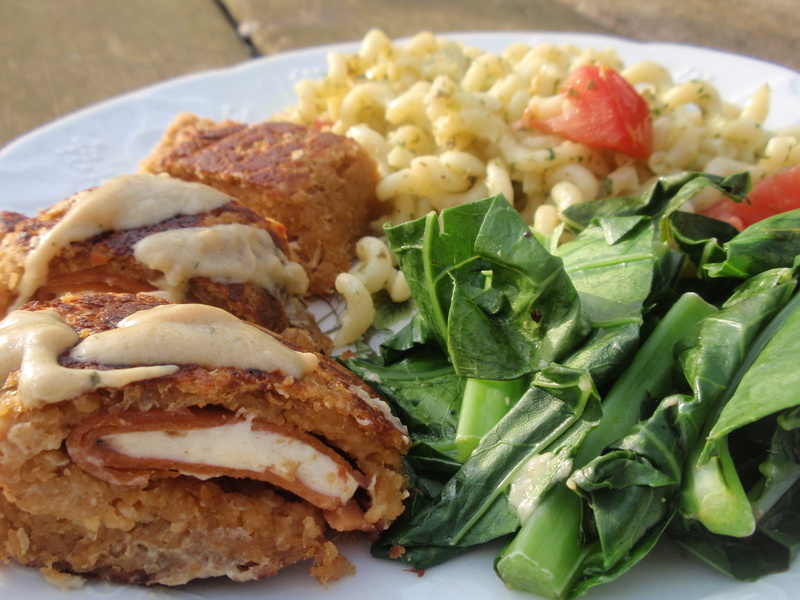 Sauce for Cutlet Cordon Bleu – In a bowl, combine 1 t vegan worcestershire sauce, 1 T dijon, 2 T sherry, 2 vegan bouillon cubes (I use rapunzel) and 1 c soy milk. In a pan, melt 3 T butter. Add 3 T flour and stir until bubbly. Add the mixture from the bowl and heat through. Spoon over cutlets. Ice cream and pizza – the two things I thought I would have the hardest time giving up when I became vegan. Boy was I wrong! Dairy-free ice cream options are really delicious! My personal favs are purely decadent cookie dough and Yours Truly Cones from Tofutti which I can get at my local Shoprite. When I “need” an ice cream sundae I can go to Lula’s and I am completely satisfied. Also, I can join in on any trip to Haagen Dazs or Ben & Jerry’s because they always have a few flavors of sorbet that are yummy and infinitely better for my figure (but I always ask about the ingredients because you can never be too sure – Haagen Dazs chocolate sorbet, for instance, has egg whites). As for pizza – in the beginning, I was just fine with ordering it cheeseless with lots of veggies, but then I found daiya. Who knew a vegan cheese could taste so good and melt so well? Now, I can either bring a bag to my local pizza place and they will throw it on my pie, or I can make pizza at home and then it is even more satisfying, and imho, even more scrumptious. One or another of my kids is usually more than happy to help make pizzas and the dough can either be bought frozen, or made from scratch. I made the dough here from a recipe in the Vegan with a Vengeance cookbook. It is very simple to make and always comes out perfectly. Most pizza dough recipes are vegan, so just find one and go for it! The best thing about making pizza at home is being able to really experiment and design your own perfect pie. 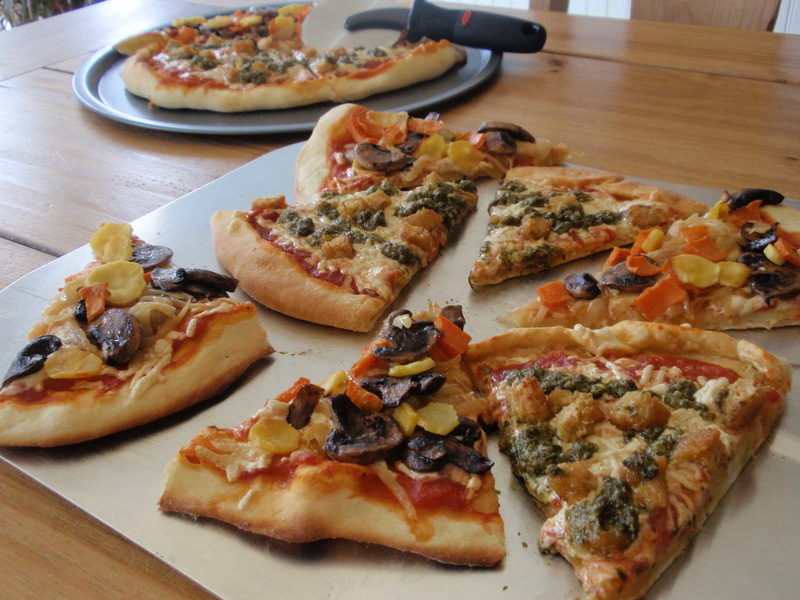 Here, my daughter made a “chickn” pizza with salsa verde, and extra garlic baked into the crust, while I chose one with truffled mushrooms, caramelized onions, roasted parsnips and roasted sweet potatoes. Imagine all the possibilities!! Being vegan has never been so easy!!! Seitan – probably my favorite meat substitute. Why? It’s highly nutritious and very economical. It is also low in fat, cholesterol-free, very high in protein, and a good source of iron – and it tastes delicious! Sometimes, I will use store-bought seitan, such as West Soy, but I much prefer to make it from scratch. It is simple to do, and although it does take some time, most of that time is not working time, but just waiting time. It only takes about 15 minutes of actual prep time and the rest of the time, it is just on the stove simmering and then cooling. Once you get in the habit of making it, you will see how very easy it is. I make a double batch every week. One half I use for a dinner, such as this one, and the other half I slice thin and marinate in spices and pickle and beet juice in the fridge to use for sandwiches (tastes and looks like cold cuts). It also freezes really well. 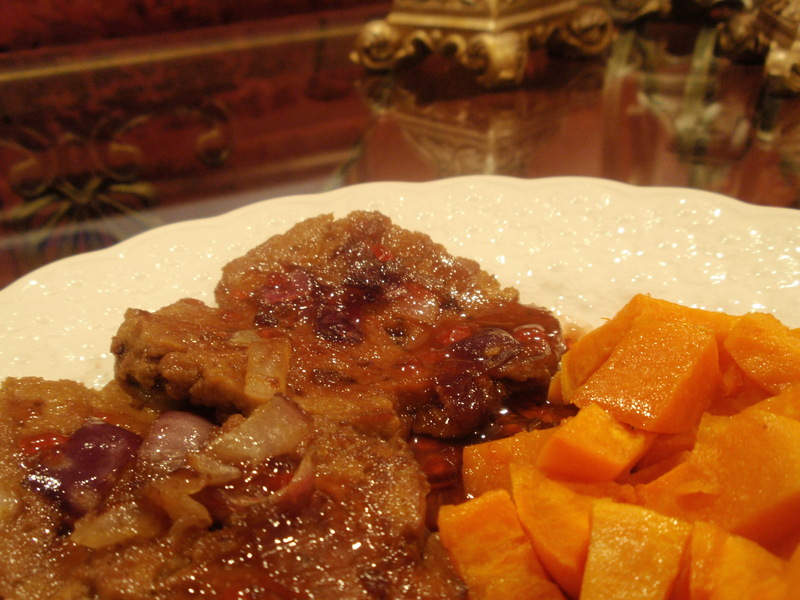 So, I hope you enjoy this recipe and that it inspires you to try the one below for homemade seitan. Heat the oil over medium heat. Add the onion. Sprinkle thyme and 1/2 t salt on the seitan. Once the onion is translucent, add the seitan slices, seasoned side down, on top of the onions. Cook 5 minutes on each side. Remove seitan. Reduce heat to low and add preserves, vinegar and 1/2 t salt. Cook a few minutes to heat through. Spoon over seitan and serve. OMG best seitan ever – this is essentially the same recipe from Isa Chandra Moskowitz’s Vegan with a Vengeance, with just a few changes. All Isa’s cookbooks are incredible!! In a large bowl, combine the 3 first ingredients. In another bowl, combine the next 4 ingredients. Pour the wet into the dry and mix with your hands and knead for until all incorporated. Knead in the chickpea flour. Let dough rest for 5 minutes. Meanwhile, mix the broth ingredients in a large pot, but do not heat yet. Roll the dough into a 10” log and cut into 6 pieces. Place the pieces into the cold broth. Partially cover and turn the heat to high. Bring to boil, then reduce the heat to low and simmer, partially covered, for 90 min. to 2 hours. Remove from heat and let cool in pan for another hour if you have the time. At this point, you can use the seitan, store in the broth in the fridge for up to 5 days, or freeze for later. I usually cut each of the 6 pieces into 3 cutlet size pieces for a recipe like the one above. It seems coconut oil and coconut milk are all the rage these days. Thought to help with many ailments (eczema, heart disease and most recently Alzheimers, to name a few) and also great for your skin and hair. I love coconut milk in my cereal, I love it for baking, and tonight, I decided to try to cook with it and the result was a delicious meal that we all enjoyed! I added only a tiny amount of curry because my kids are not huge fans, but feel free to add a lot more, to your liking. I served this coconut tempeh over coconut rice (when you make your rice, just add coconut milk in place of half the water) and it’s all gone!! A great, fast, fragrant and yummy meal! Heat olive oil in a large skillet over medium high heat. Add the onion and cook for about 5 minutes, until translucent. Add earth balance and when melted, add the tempeh. Cook the tempeh to brown it a bit. Next add the garlic powder, onion powder, salt, and curry powder. Stir well. 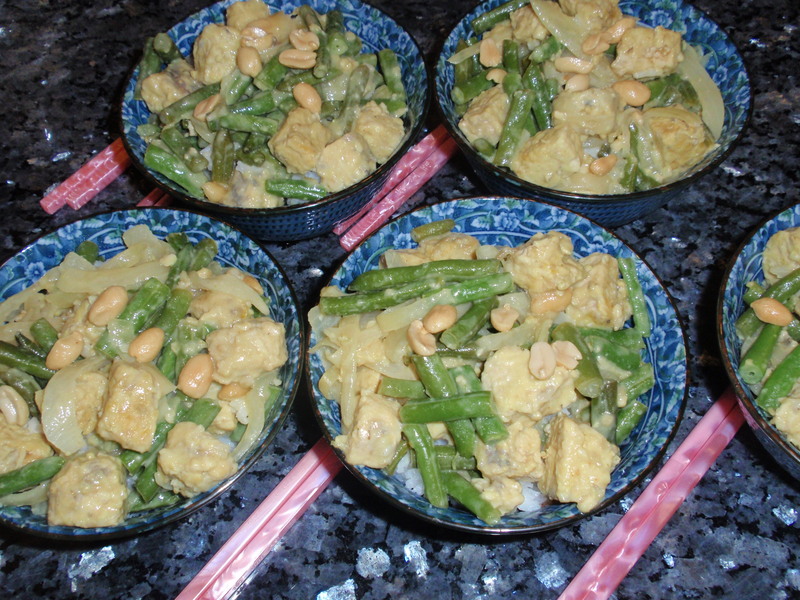 Add green beans and the coconut milk. Reduce heat to low and cover. Simmer for 10 – 15 minutes. 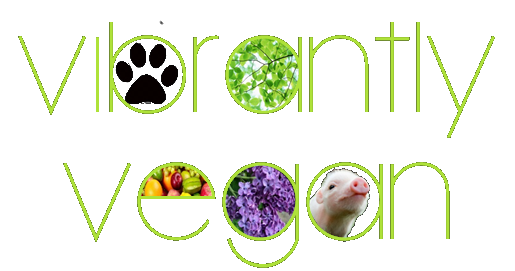 People often ask me, upon hearing that I am vegan, “what can you eat?” Well, I usually reply with a list of my favorite foods, from coconut ice cream to seitan marsala, but I can tell that they’re usually not convinced. That is why I want to share this link today. Try taking a copy with you to your nearest Trader Joe’s store, and I guarantee you will be amazed at how many things you never realized were free of animal products. It saddens me how, as a society, we have lost all concern for what we are eating. For example, for Valentines Day, I went to a few stores, looking for chocolates or candy that I could get for my family. Would you believe that just about everything I picked up either had milk, gelatin, or some other animal by-product? Most people don’t even realize when they eat a marshmallow, for example, that it contains a substance derived from the collagen inside animals’ skin and bones. Yuck!! So, in the interest of being mindful of what you eat, check this list out. 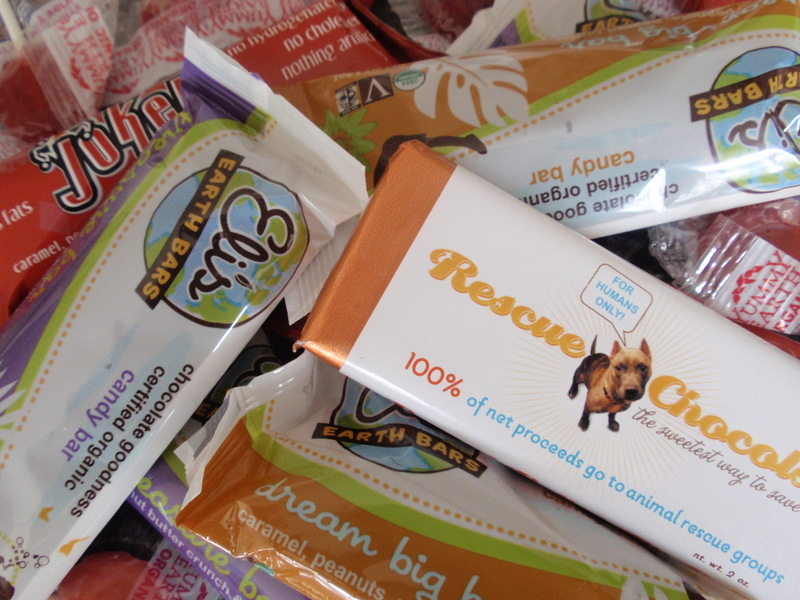 Oh, and if you want to enjoy great vegan chocolate, check out Rescue Chocolate and Sjaaks, both of which I ordered for Valentines Day and were just perfect!! !